One of the most famous E-Types ever built is to accompany Olympian Jessica Ennis when she drives the all-new F-TYPE in this year’s Lord Mayor’s Show. 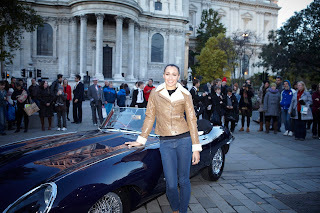 1600 RW, which is owned by Classic Motor Cars of Bridgnorth, joined the all-new F-TYPE in London on Thursday 1st November when Olympian and Jaguar Academy of Sport Ambassador Jessica Ennis announced she is to drive the new Jaguar car in the Lord Mayor’s Show on November 10th. The famous car will make its appearance alongside another celebre E-Type, Chassis No. 24, at the Lord Mayor’s Show. 1600 RW or Chassis No. 4 was the fourth E-Type to leave the production line and the first one to be sold. It was completed and despatched in April 1961 to its new owner who was none other than Jaguar’s own Racing Team Manager, Frank ‘Lofty’ England. After sitting in a garage for 25 years, the car was bought and restored by CMC. The second E-Type will be Chassis No. 24 or the “Daily Mail” E-Type, which was one of the two examples that the newspaper gave away in a competition it ran in 1961 to win "the most wanted car in the world". The car also underwent a full restoration carried out by CMC and is now in excellent condition. More than 500.000 people will see Jessica Ennis drive the all-new F-TYPE in its UK debut after it was unveiled at the Paris Motor Show. CMC took part in last year’s Lord Mayor’s Show when it celebrated with Jaguar Cars the 50th Anniversary of the E-Type. It is delighted to be supporting them again with two of the most famous E-Types ever. If you are unable to make the Lord Mayor's Show on the 10th November and you happen to be in London, you can view E-Type 1600 RW as it is being displayed from 1st to 9th November at the Grange St. Paul’s Hotel, 10 Godliman Street, London EC4V 5AJ.